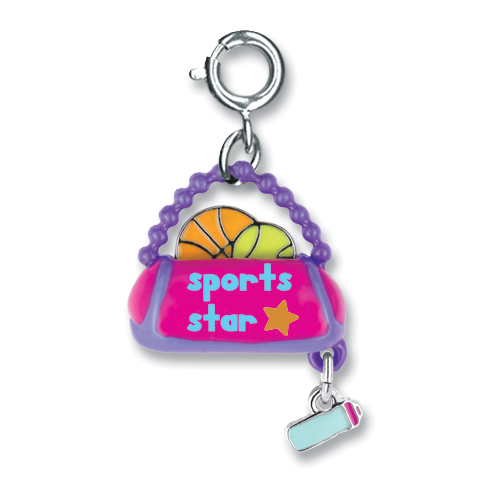 Add a splash of sports pizzazz to your charm bracelet with this sporty CHARM IT! Sports Star Bag charm. 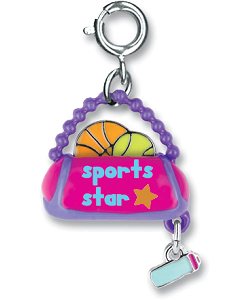 With a basketball and a tennis or softball popping out of the top and a light blue water bottle dangling from the side, this creative Sports Star Bag charm is covered in colorful pink and purple enamel with blue lettering and orange star, perfect for adding fun and personality to your charm bracelet. With a simple snap of a clasp, you can personalize your CHARM IT! jewelry with this eye-catching CHARM IT! Sports Star Bag charm.